This recently renovated Victorian house is located just 5 minutes walk from the centre of Hay-on-Wye. It is the ideal base for a holiday break spent browsing the many bookshops in Hay, or exploring the beautiful local landscape, whether that be on foot, by bike or on the river. The house is well suited to families and couples looking for a relaxing getaway and is furnished throughout with bespoke furniture, handmade by the owner in his local workshop. These pieces include the beautiful kingsize bed and the exceptionally comfortable bunk beds. 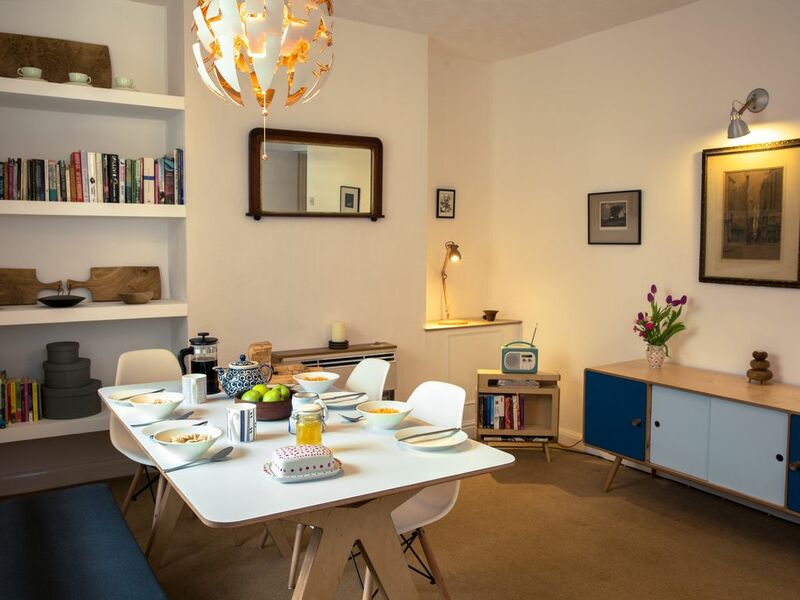 The well equipped kitchen is provided with a washer/dryer, as well as tea and coffee and other cooking essentials. A sheltered garden to the rear provides a lovely place to enjoy a summer meal. Unusually for Hay-on-Wye the property benefits from off-street parking. Hay-on-Wye is a friendly and bustling market town with a fantastic selection of unique shops and plenty of fabulous places to eat. It's unrivalled reputation for second hand bookshops is well known as is the annual Hay Literary Festival. Our location at the foot of the Black Mountains gives easy access to stunning hillwalking and there are endless opportunities for exploring by bike, both on and off road. Hay is located on both the Offa's Dyke long distance path and the Wye Valley Walk. Your host can provide advice and maps to assist with these activities, as well as offering tips for exploring the beautiful river Wye by canoe (available to hire locally). I am a furniture designer and maker by trade and I have taken the opportunity to furnish my holiday home with various pieces of my own work. I also enjoy cycling in the fabulous countryside that surrounds Hay-on-Wye, both off road and on the quiet country lanes. During the warmer months my family and I spend a lot of time in and around the river Wye which is just a short walk from home.